It’s still not good with regards to dark skies or sociable hours to image during July. I see from my notes that it is not worth starting imaging much before 11.00 p.m. but after no imaging for the whole of June – cabin fever starts to set in.So be prepared for some very late evening (early morning) sessions during July. The question then becomes – what targets are worth looking at. Well, Cygnus is very well-placed during the next couple of months, so if you have a Summer mega project you want to undertake, it might be good to start it off in early July, and to pick a Cygnus object. 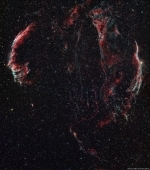 For June 2008 I shall choose the Veil nebula as the Imaging Object of the Month. This one is tough, and is certainly not for the beginner. But get enough hours in on this one and you’ll be richly rewarded. The Veil nebula complex is a faint supernova remnant in Cygnus and it needs a lot of careful nurturing to get a good image on this one. Being faint means you’re going to need long sub-exposure times, I used a minimum of 10-minutes for the RGB data. Also, if you’re using a one-shot colour camera, you’ll quickly find that RGB data alone is not good enough for a high quality image – you’ll be wanting to take H-alpha and OIII narrowband data as well. Finally, if you don’t think that’s bad enough, if you want to capture the whole of the Veil nebula you will need a very wide field imager, or you will need to take a mosaic. Even with the huge 3.33 x 2.22 degree field of view of the Sky 90/M25 C combination I was forced to make a 2-frame mosaic to get the whole of the Veil (and even then I missed a tiny bit way down in the south!). The Summer of 2007 mega-imaging project for me was the whole of the Veil nebula in RGB, H-alpha and OIII. It amounted to over 32-hours of total imaging time! I am not sure if I am going to beat this personal record on a single object any time soon.